Image caption Mr Perry is from Kirk Michal on the Isle of Man. A motorcyclist who died after crashing on the Isle of Man's A18 Mountain Road has been named. Michael Perry, of Kirk Michael, crashed on a section of the road known as the Mountain Mile at about 15:45 on Sunday 5 August. The 50-year-old was pronounced dead at the scene and police are appealing for witnesses as investigations continue. No other vehicles were involved. 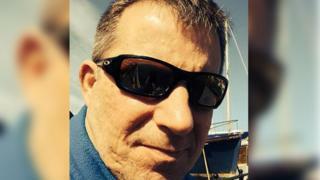 Mr Perry was the fourth motorcyclist to die on Manx roads since 1 July. Image caption The Mountain Mile is a 1.3 mile (2.09 km) section of the TT course.